Eclipse glasses. What's the big deal anyway? The 2017 eclipse wasn't an earth-shattering event for me at first. I tend to brush off anything that gets hyped. But as the eclipse date got closer, I started to buy in. And then I couldn't easily find glasses. Go figure. But hubby came through, and I now have glasses. But, big deal, right? 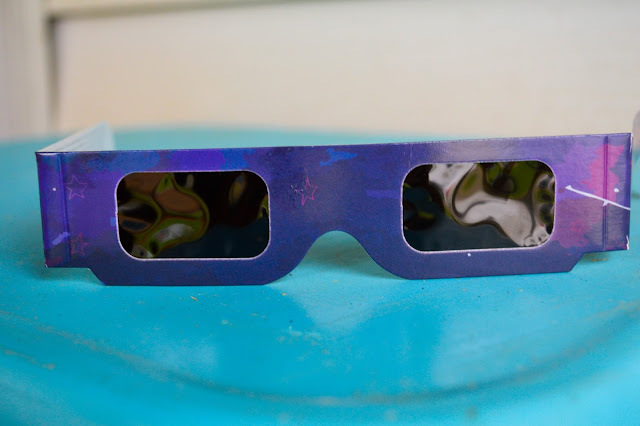 I'm not alone in my eclipse glasses ownership...and really, the struggle to get glasses isn't the story anyway...so what is? A few years ago, God spoke to my heart in a powerful way I clearly understood. I love it when He does that! All of a sudden, I had this term "Jesus Glasses" to weigh and ponder. That, for those of us, in the words of Romans 10:9--who confess with our mouths that Jesus is Lord and believe in our hearts that God raised him from the dead--the Father sees us through Jesus Glasses. Perhaps it seems overly simple...childish even...to imagine God wearing Jesus Glasses as He looks on his children...on me. Nevertheless, it was a very potent, visual lesson for me. And I needed it. I STILL love to think on it. And last night, as I prayed with my oldest, God once again used the visual. 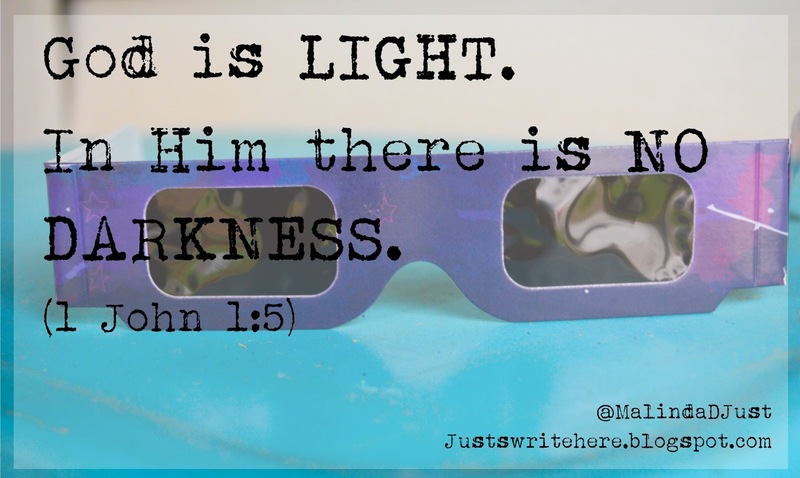 This time to make a comparison between Jesus Glasses and solar eclipse glasses. In order to look at the eclipse, the rule is...wear glasses! It is not safe to look with the naked eye. An eclipse has the potential to damage eyesight for life. Not a risk I want to take. So too, for the Lord. He cannot look on us without the lens of Jesus. Without the covering of Jesus, we are far removed from His glory. We are in darkness. And in HIM there is NO darkness. The LIGHT cannot exist in the dark. 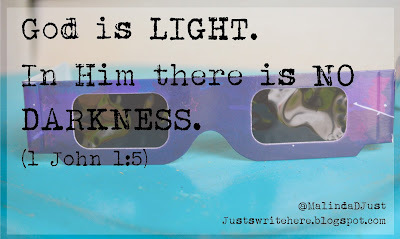 Like we need to wear specifically made glasses to view the eclipse, God designed specifically made glasses to usher us into His presence. Jesus. Always Jesus. Only Jesus. My understanding of the implications of the cross continue to develop. There was a time when I believed in Jesus, but just didn’t recognize my own deep, flesh-life sin. I was missing out on God-Light shining on my sin because I didn’t want to see. I was so prideful. It’s still a sin that can easily trip me up. But, God continues His good work in me and He will be faithful to complete it. So, I choose to do my part. To confess with my mouth and believe with my heart. For Romans 10 continues to say, "For with the heart one believes and is justified, and with the mouth one confesses and is saved." (vs. 10) I trust in that today. I trust that God looks at me through Jesus Glasses, seeing me as righteous before Him. Only God is light. Only Jesus was blameless. Like it or not, we’re all related to Adam and Eve, and it’s a learning curve to fall under God’s authority. We don’t naturally submit to anything or anyone. But submitting to God’s authority is the only way. May you be covered under the life-giving lenses of Jesus today and always. Lovely analogy. I guess that's why the .bible calls us the righteousness of God in Christ Jesus. Always in and through Jesus can we satisfy God, never in ourselves or by our own power. Bless you! Thank you! Always, always Jesus!